Deanne will be awarding a $10 Amazon or BN.com GC (winner’s choice) to a randomly drawn commenter during the tour. Rafflecopter Link is at the bottom of the post. Good Luck! But who can blame her? The groom is gorgeous and his two kids tug at Gabriella’s heart in a way that overcomes all her best intentions. Before long she’s in over her head, fixing her mixed-up plans and helping the children and dad come to terms with their haunting grief for the mother and wife they lost years earlier. The last thing Ryan had expected to see when he’d entered the cottage was Gabriella flat on her back in a puddle of water, inspecting the rear of the toilet. Chloe was holding a bucket and a sopping wet towel, and Peter was nowhere to be seen. “Dad!” Peter came flying from another room and flung himself into Ryan’s arms. “RYAN?” Gabriella yelled and quickly sat up. The thump of her head smacking the toilet bowl echoed around the tiny room. Ryan grimaced. Gabriella sat on the wet floor, near tears, rubbing at the welt already forming on her forehead. She hung her head in her lap and began to cry for real. Ryan had to hold back a smile. She looked so much like a wet cat. And, to top it off, she had yet to hear how wrong things had really gone with the day. Chloe’s face lit up with an expression he hadn’t seen in years. For a few moments at least he was back to being her superhero dad. With an English teacher for a mom, DEANNE WILSTED, grew up reciting conjugation instead of nursery rhymes. Now, forty years later, she’s sharing that special skill through her writing and her mothering. 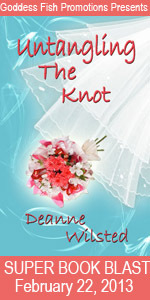 Her first book, a contemporary romance called BETTING JESSICA, was released October 2011. 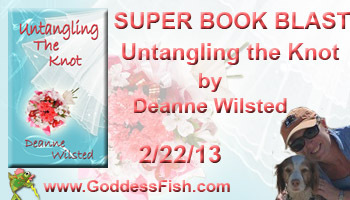 Her second Novel, UNTANGLING THE KNOT, is due out in February 2013 from Soul Mate Publishing. She is currently marketing her third book for publication and writing her fourth, fifth and sixth while blogging about the crazy stuff she overhears while writing.